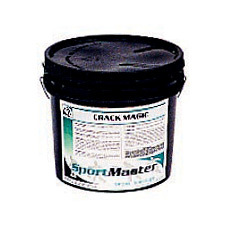 Crack Magic is a 100% acrylic elastomeric crack filler designed for filling cracks in asphalt or concrete tennis courts and other sport and recreational pavement surfaces. Typically, 1 gallon will fill approximately 75-150 feet of cracks. 100% acrylic elastomeric crack filler designed for filling cracks in asphalt or concrete. Crack Magic crack filler is a 100% acrylic elastomeric crack sealant designed for sealing cracks in asphalt and concrete pavement sport surfaces. It provides a protective barrier against moisture intrusion into pavement surfaces. Crack Magic is both economical and easy to use. Cracks must be cleaned entirely of dust, dirt, and debris including vegetation. Crack Magic is a ready-to-use product. Do not dilute. Fill cracks completely with crack sealant. Smooth flush to adjoining pavement with putty knife, trowel, or u-shaped squeegee. Feather edges for smooth transition to playing surface. Allow material to dry before opening to play or applying acrylic sport coating. Temperatures must be above 50°F both during application and for a period of 24 hours after application. View in Catalog 1 gal. Pail 10 lbs.